I'd tried plotting in the past, and most of my stories felt flat and boring. Write down what I'm going to write? In order? Isn't that redundant? So I turned to pantsing. After creating a beginning point, a few middle points, and a fantastic end, I'd start writing. That worked fine until last year. MY WIP (Work in Progress) was the second book in a series, and the characters were wandering all over my storyworld, taking trips I'd never signed off on, and just in general making a mess of things. When I did my revisions, I managed to regain control, but it required massive rewrites. 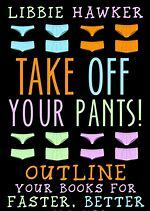 During this time, I heard about a book by Libbie Hawker titled Take Off Your Pants: Outline Your Books for Faster, Better Writing. Faster, better writing? Sign me up. It was a quick read, and I decided to give her method a try. The outline template was fairly simple, which was encouraging (especially since other outlining books I'd read had offered a thirty-seven page outline template for my convenience). I took a day to outline my story and then began writing. And I found myself writing faster, if not better. But the best part of this experiment was my plot outline -- I knew where I was going with my story, and I could tweak events to support it. Plus, I could make my outline as simple or as complex as I wanted. Although I'm about a quarter done with my rough draft, the process feels better than it did with my other book. Part of me misses the purely unstructured way of pulling ideas out of the ether and writing my characters reactions. There's a thrill to creating a story in that manner. But what I usually end up with isn't a plot that provides a supportive framework for my story arc. I'm not going to try to convert all of you pantsers out there. But maybe a few of you have considered trying plotting, yet you're afraid it will stifle your creativity. A simple outline, like the one in this book, might be worth a try. How about you, writers? Are you pantsers? Plotters? And why? Let us know below! Great post, Jill! “the characters were wandering all over my storyworld, taking trips I'd never signed off on, and just in general making a mess of things.” Love this line. It made me laugh. I tried pantsing when I first started writing, but I couldn’t get past the 5-10K mark. Plotting works best for me. I think I might be converted -- knowing where I'm going plot-wise is amazing.